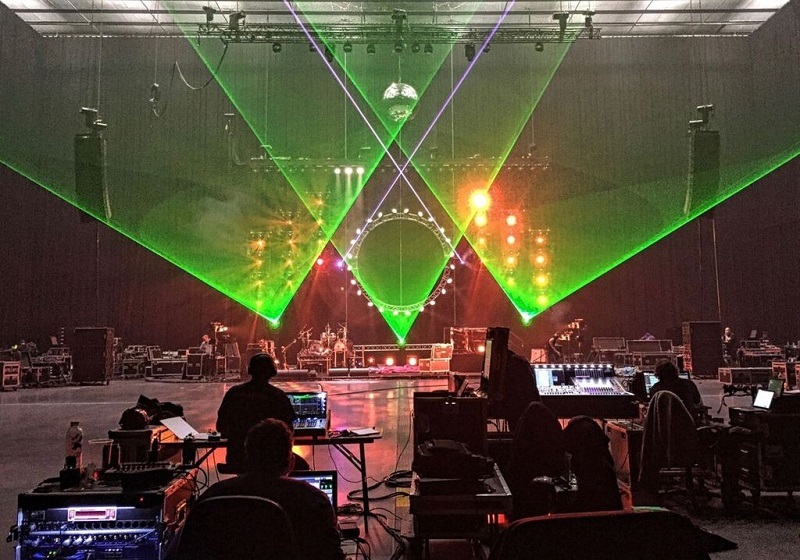 LONDON – Capital Sound is providing an Outline system that includes Superfly and GTO-SUB subwoofers and X8 amplifiers for The Australian Pink Floyd’s current tour. Helmed by FOH engineer Trevor Gilligan, the system includes up to 32 Superfly and 12 GTO-SUB subwoofers as the main L/R system, 18 Mantas 28 modules for side-hangs and six LIPF-082 lip-fill enclosures, all powered by just four Outline X8 amplifiers. Probably the world’s premiere tribute act and certainly the best-known, The Australian Pink Floyd’s 2018 tour marks 30 years of celebrating the music of one of the most influential bands of all time. In those three decades TAPFS have sold in excess of four million concert tickets, performed in 35 countries and were even engaged by legendary Pink Floyd guitarist David Gilmour to perform at his 50th birthday party. The essence of a tribute act is the reproduce as accurately and faithfully as possible every nuance of the originals and that is never more true that with the music of Pink Floyd. Multi-layered, by turns delicate and thunderous, Floyd’s vast and immersive soundscapes have to be delivered in every detail to audiences that know the material inside out – a big ask for both crew and PA system. Trevor Gilligan is manning front of house for the tour, for which London-based Capital Sound Hire have provided their newly-purchased inventory of Outline’s brand new ‘Superfly’ compact line-source loudspeaker system. The system configuration varies according to venue but Capital’s Outline equipment touring with TAPFS includes 32 Superfly and 12 GTO-SUB subwoofers as the main L/R system, 18 Mantas 28 modules for side-hangs and six LIPF-082 lip-fill enclosures, all powered by just four Outline X8 amplifiers.